If you want to make your own mac CD, DVD cover, double cover labels, jewel cases, case inserts, spines, and more, need custom video and MP3 collections, have a lot of family photos and data for backups, or would like to create unique gifts on Mac OS X, then you have entered the right place. 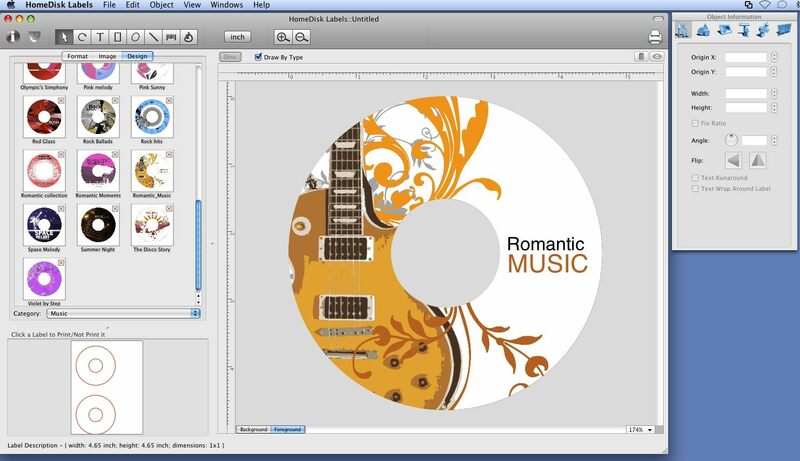 HomeDisk Labels For Mac is a CD/DVD disc cover designer and dvd label maker that helps you to create mac CD, DVD labels etc. on Mac OS X. The Home Disk Labels is a CD/DVD disc cover designer and dvd label maker. - HomeDisk Labels For Mac Support insert table to label. Qweas is providing links to HomeDisk Labels For Mac 1.8.2 as a courtesy, and makes no representations regarding HomeDisk Labels For Mac or any other applications or any information related thereto. Any questions, complaints or claims regarding this application HomeDisk Labels For Mac 1.8.2 must be directed to the appropriate software vendor. You may click the publisher link of HomeDisk Labels For Mac on the top of this page to get more details about the vendor.